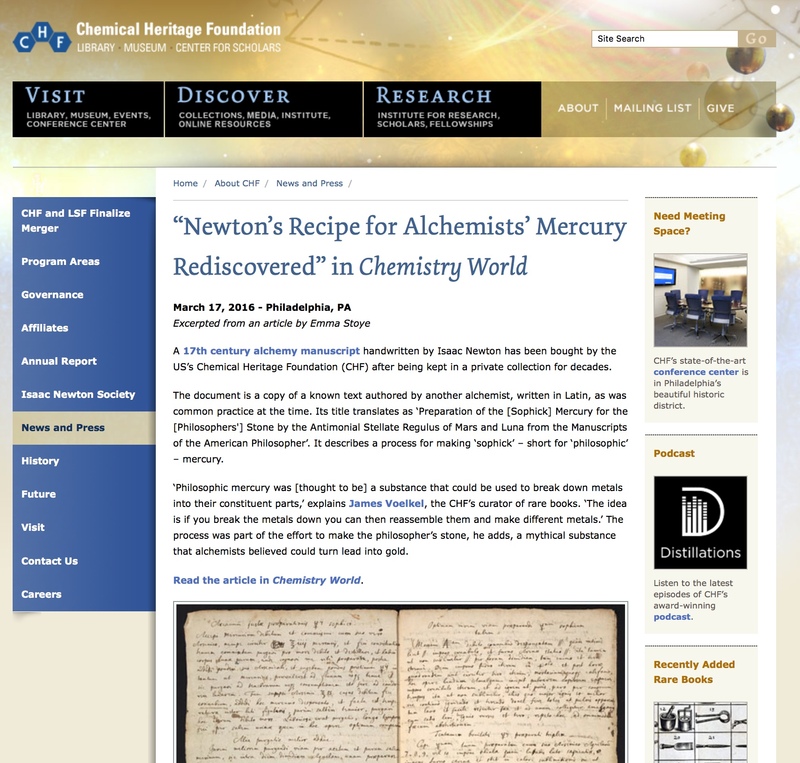 When Chemistry World reported on a Newton manuscript that CHF had recently purchased, it started a small epidemic of posts on Newton and alchemy. Within a few days hundreds of sites—ranging from sites like the Daily Kos and CNN to the Ancient Code and Facebook posts—had summarized, linked to, reposted, or transformed the original report. Following the Chemistry World article as it spread across the internet reveals the process replication and transformation as the information drifted further from the original in time and space. When you restrict the results to the first month following Chemistry World’s report and you prune out duplicate results and other irrelevant hits, you still have hundreds if not thousands of hits for this story about Newton’s interest in alchemy. 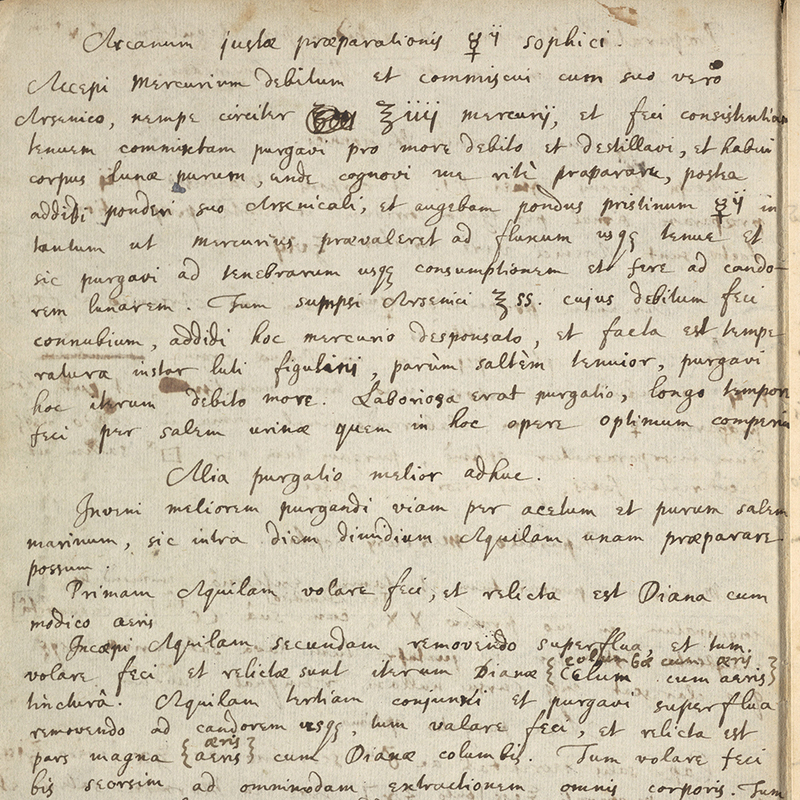 Chemistry World first reported on the manuscript in “Newton’s recipe for alchemists’ mercury rediscovered.” The manuscript contained Newton’s hand-written copy of George Starkey’s recipe for “philosophic mercury” as well as some of his own notes for distilling a volatile spirit. Since the 1930s this manuscript had been in private hands but will now be available to scholars thanks to the Chemical Heritage Foundation, which had recently purchased it and will make scans and a transcription available through The Chemistry of Isaac Newton project. The Chemistry World article is rather dry, beginning with the title that certainly doesn’t excite interest—“alchemist’s mercury”? yawn. Importantly, the article doesn’t make grandiose claims, but sticks to a rather conservative: “Until now, the contents of this particular manuscript had not been made public.” Other than the title, there’s no language of rediscovery. No language of surprise at Newton’s interest in alchemy. CHF immediately excerpted and linked to the Chemistry World post. The Chemical Heritage Foundation immediately summarized and linked to the Chemistry World report. Although CHF has since removed that post, it is still available from Web Archive. Sir Isaac Newton may have been one of the greatest scientists who ever lived, but his contributions to chemistry leave much to be desired. … Newton and his fellow alchemists were simply doing the best they could given the dearth of scientific knowledge. Gizmodo doesn’t want us to blame Newton for believing in alchemy. He was a great scientist, one of the greatest, who just happened to live in an ignorant, benighted time. A week after the initial report, the Daily Mail posted a derivative of the Chemistry World article, “Isaac Newton’s recipe for ‘Philosopher’s Stone’ rediscovered.” They reworked Chemistry World’s original so that it would appeal to their readers, as the subtitle indicates: “17th-century alchemy manuscript reveals ingredients it was thought could make people IMMORTAL.” Because the their readers care less about the finer alchemical details and more about immortality and transmuting lead into gold, and because Harry Potter had popularized the Philosopher’s stone, the Daily Mail foregrounded these themes. Filed under “WTF?” are the posts that appeared on various cooking sites the same day as the Daily Mail’s article, e.g., the Good Cooking Store’s “Isaac Newton’s recipe for ‘Philosopher’s Stone’ rediscovered” and Cooknology’s “Isaac Newton’s recipe for ‘Philosopher’s Stone’ rediscovered.” These posts seem to have been generated by running the Daily Mail’s article through a simple algorithm that had a tenuous grasp on English. The algorithm replaced definite articles with indefinite articles and identified some bizarre synonyms. At times the synonyms read like a middle school student who, having discovered a thesaurus, transforms “human” into “tellurian.” At times the synonyms distort the text in strange ways as when “volatile spirit” becomes “flighty suggestion” or “minute example” becomes “notation instance.” I assume these sites have some automated process that scrapes certain sites for cooking related posts, transforms them, and reposts them in an effort to generate traffic and advertising income. 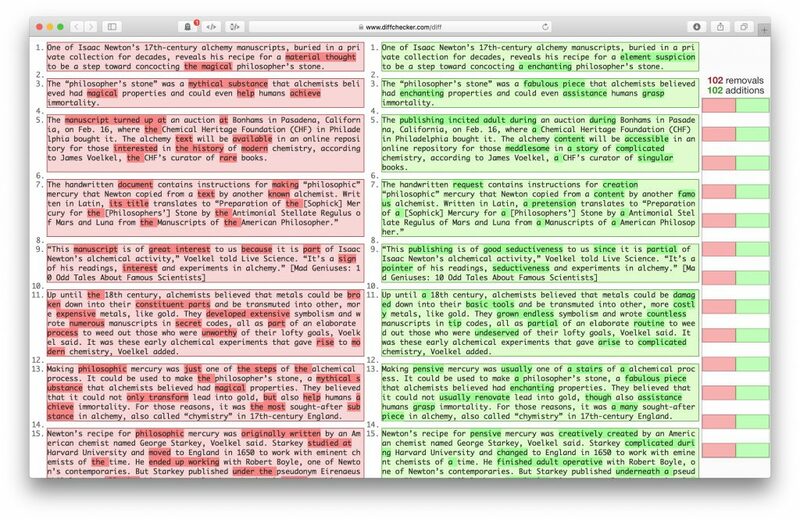 I used DiffChecker to compare the Daily Mail’s version to Cooknology’s version. This screenshot highlights some of the systematic changes some algorithm made to produce the Cooknology version. though best best known for his study of gravity and his laws of motion, Newton also apparently wrote more than a million words of alchemical notes throughout his lifetime. Despite contacting CHF and quoting Jim Voelkel a number of times, Live Science’s version offers much of the same content in slightly different form. The only new information indicated that the manuscript had come up for auction two other times, in 2004 and in 2009. Once again, filed under “WTF?”, Live Science’s version also spawned an algorithm-generated version on cooking sites. 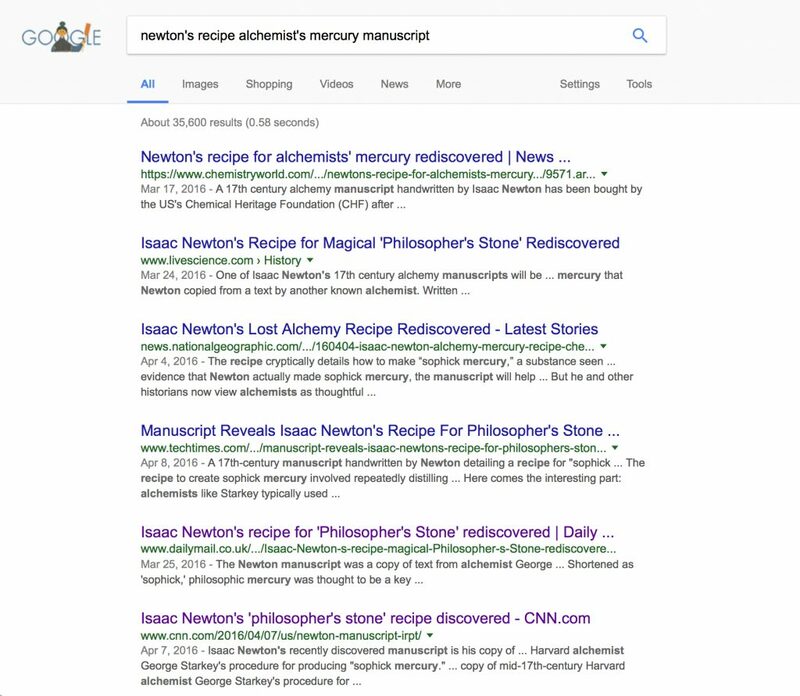 Sebastian’s Fine Food, for example, copied CBS’s version of Live Science’s article: “Manuscript reveals Isaac Newton’s recipe for magical ‘philosopher’s stone’.” Again, the algorithm substituted synonyms and replaced definite with indefinite articles. But this time the algorithm doesn’t do as good a job of it. Some of the replacements make no sense. For example, “up” is replaced by “adult” as in “ended up working” that becomes “finished adult operative.” In another instance, “great interest” becomes “good seductiveness.” Is this some perverse way of driving internet traffic? 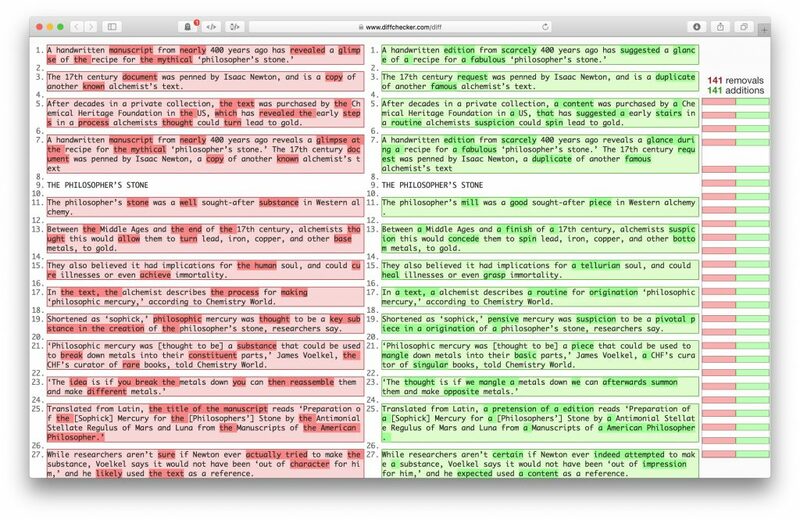 I used DiffChecker to compare Live Science’s version with Sebastian’s Fine Food’s version. This screenshot shows some of the 102 changes the algorithm made. Two weeks later through reputable outlets such as National Geographic, FOX News, and the Washington Post the story had permeated internet news sites. These three sites give the impression that they are brining something new to the story, but do little more than recycle much of the same content. National Geographic’s “Isaac Newton’s Lost Alchemy Recipe Rediscovered” is entertainingly written—it opens with an enticing question: “Combine one part Fiery Dragon, some Doves of Diana, and at least seven Eagles of mercury, and what do you get? A key precursor to the Philosopher’s stone….” The speculation that Newton turned to alchemy to “possibly strike it rich” seems dismissive. We learn a bit more about George Starkey, but the focus remains vague surprise that “Newton—a father of modern physics and co-discoverer of calculus—was greatly influenced by alchemy and his collaborations with alchemists.” In addition to citing Jim Voelkel, the article quotes Bill Newman, who had been conspicuous for his absence in the other articles. In this version Newton’s alchemy is enlisted in the service of his science, especially optics. Newton, it was announced this year, had a secret obsession with the lowest of the pseudosciences: alchemy, or the pursuit of a “magic” substance that will change one element into another. To think that one of humanity’s best minds would have written over a million words on something out of bad fantasy adventure writing is concerning—but maybe it shouldn’t be, because his research eventually led to something earth-shattering in another field. For the record, dear Daily Beast, it wasn’t announced this year that Newton was interested in alchemy. It has been known for a long time. The article you cite points out that already in the 19th century Newton’s biographer was aware of his interest in alchemy. Scholars have written numerous books and articles on Newton’s alchemy. Bill Newman, whom you cite, has spent much of the last 20+ years working on Newton’s alchemy (even attempting to recreate a number of his laboratory practices and experiments). Maybe you just learned of it, but that’s just your own ignorance. And when did alchemy become the “lowest of the pseudosciences”? Both the Daily Beast’s and the Washington Post’s articles are full of problems and add little to the broader story. FOX News’s “Isaac Newton and the ‘philosopher’s stone’: Manuscript reveals alchemy recipe | Fox News” is pleasantly bland, echoing what we’ve seen elsewhere and adding nothing new. Three weeks after the Chemistry World post, purportedly reputable news and other specialized sites are spooning out bits from previous accounts as if they were some Newton-themed Smörgåsbord. These later posts, e.g., History.com, CSMonitor, Phys.org, CNN, Atlas Obscura, Smithsonian Magazing, contribute nothing to the conversation nor do they add anything to the information provided in their sources. These later posts seem to accomplish little beyond duplicating and remixing information widely available. By this point news has become merely repetition—the echo chamber of the internet is deafening. 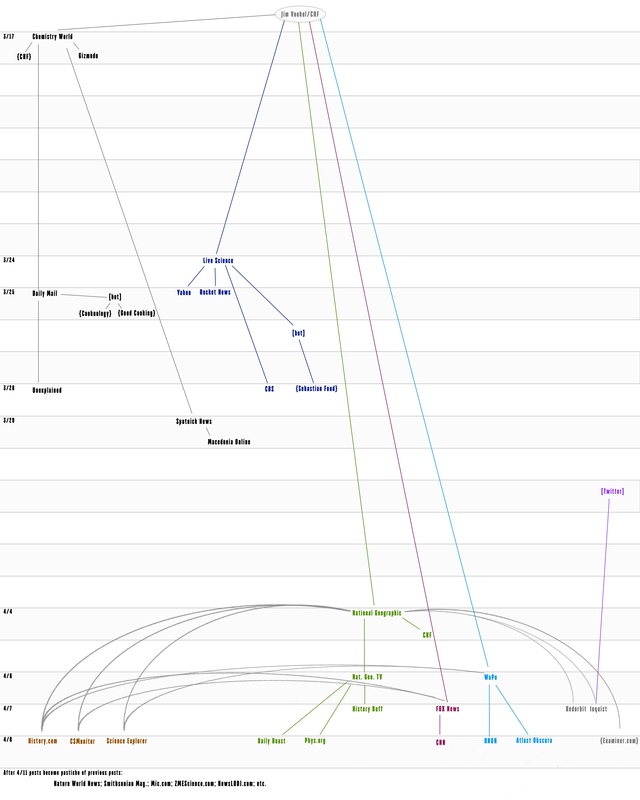 This diagram shows five major branches of this story as it spread across the internet. The versions further down the diagram tend to recycle more and more of the same material. What distinguished these five branches was their reliance on Jim Voelkel as a source. Postscript: I want to point out that this entire story was scarcely news worthy when it all began on March 17, 2016. Back in 2010 Discover Magazine was all worked up over Newton’s interest in alchemy and interviewed both Bill Newman and Larry Principe in “Isaac Newton, World’s Most Famous Alchemist.” But even then manuscripts demonstrating Newton’s interest in alchemy weren’t news. Five years earlier still, in 2005, NOVA had interviewed Bill Newman about Newton as alchemist and had created an interactive page that let you try to decode one of Newton’s alchemical manuscripts. More remarkable than Newton’s interest in alchemy is the internet’s failure to remember that long ago we discovered Newton’s interest in alchemy, as a quick internet search will reveal. 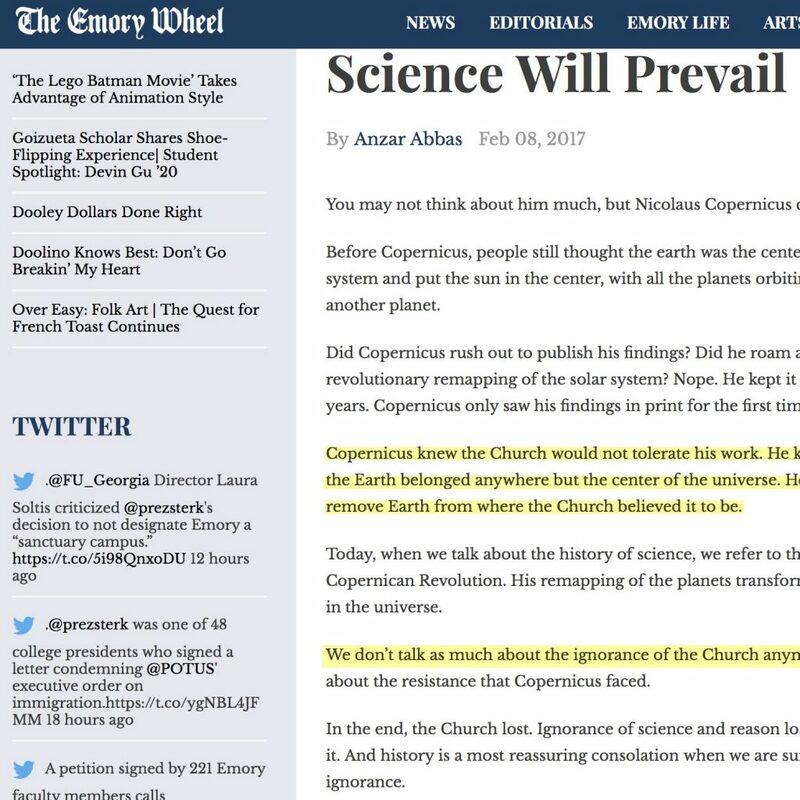 “Science Will Prevail,” Anzar Abbas reassures readers in his recent op-ed. Although the Trump administration “wants to ignore facts and instead believe whatever makes it feel most comfortable,” he is confident that “no matter what an ignorant administration may throw at science and reason, it will prevail. It always has.” To make his case, Abbas surveys key episodes when “ignorance of science and reason” impeded science but ultimately lost out to reason, evidence, and scientific facts. Unfortunately, Abbas ignores facts and believes what makes him feel most comfortable, inviting the same criticism he levels at the Trump administration. Copernicus knew the Church would not tolerate his work. He knew that he lived in a Europe that would never believe the Earth belonged anywhere but the center of the universe. He knew the persecution he would face if he ever tried to remove Earth from where the Church believed it to be. We don’t talk as much about the ignorance of the Church anymore, though there was plenty. We don’t talk as much about the resistance that Copernicus faced. Abbas hits all the major points in his version of Copernicus vs. the Church. Scientists and science boosters believe this old chestnut because, well, it makes them feel comfortable. But to believe and to traffic in this story requires that you ignore facts. There is no evidence that Copernicus worried that the Church would condemn him and his work. There is, however, Copernicus’s dedication in his De revolutionibus orbium coelestium to no less a Church figure than the Pope, Pope Paul III. Copernicus credits other members of the Church for having urged him to publish his work: Nicholas Schönberg, the Cardinal of Capua, and Tiedemann Giese, the Bishop of Chelmno. 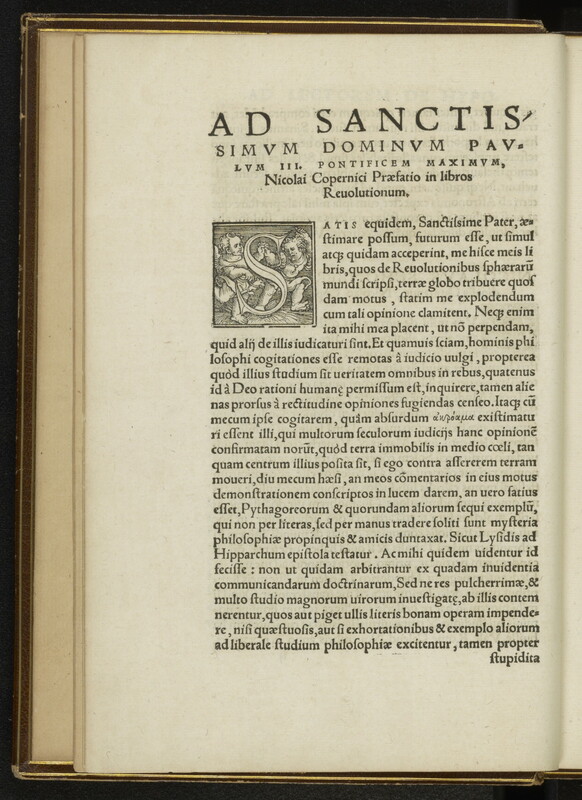 Copernicus’s dedication to Pope Paul III. Digital copies of the text are widely available, this particular copy is from the Library of Congress, Nicolai Copernici Torinensis De revolvtionibvs orbium coelestium, libri VI (1543), fol. iiv. Copernicus did worry about resistance to his theory, as he mentions in the opening lines of his preface, but he doesn’t single out the Church. Instead, he worries about ignorant people who in referring to Scriptures will distort the sacred texts. The Church found Copernicus’s so unremarkable that it didn’t take any official until 1616 when it placed De revolutionizes on the Index of Forbidden Books until it was corrected. 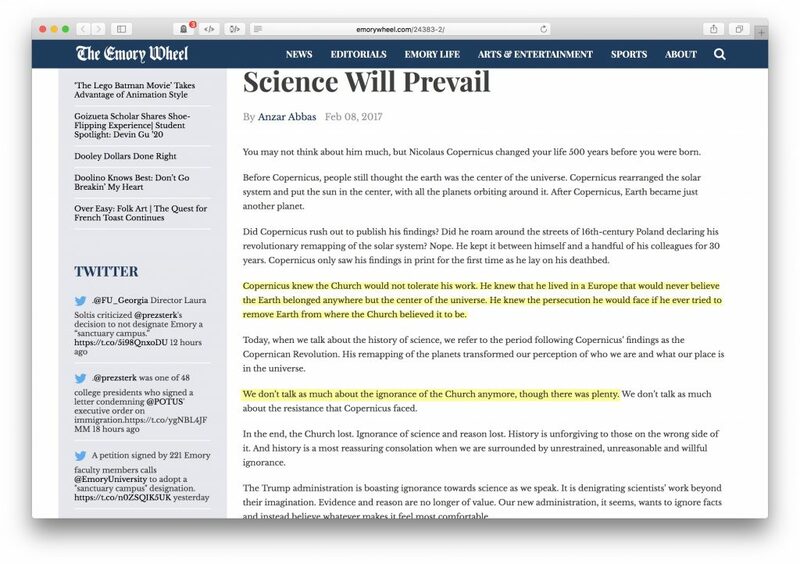 This purported conflict between Copernicus and the Church is largely a fiction, fabricated by pro-science, anti-church polemicists in the 19th century and repeated in lightly edited form for the past 150 years. And even a quick review of historical scholarship will expose it as a fiction. Scientists’ cavalier disregard for facts, evidence, and reason outside of the sciences reflects their own “unrestrained, unreasonable and willful ignorance,” and makes it difficult to take their complaints seriously. I agree, Abbas, a 21st century scholar ignoring basic truths is appalling. Science might prevail one day, but only if scientists and their boosters stop ignoring facts. Galileo’s trial and sentence occurred in 1633, well into the 17th century, not in the 16th. Moreover, Galileo was never imprisoned. Although the initial sentence was imprisonment, it was promptly commuted to house arrest. Alas, Abbas displays “unreasonable and willful ignorance” of both when Galileo was tried and what his sentence was.